Improve cleavers management by targeting the seedbank. Seed head of cleavers in the field. Photo courtesy of Christian Willenborg. Cleavers, which are difficult to manage in many crops, can reduce yield and quality and interfere with harvest operations. 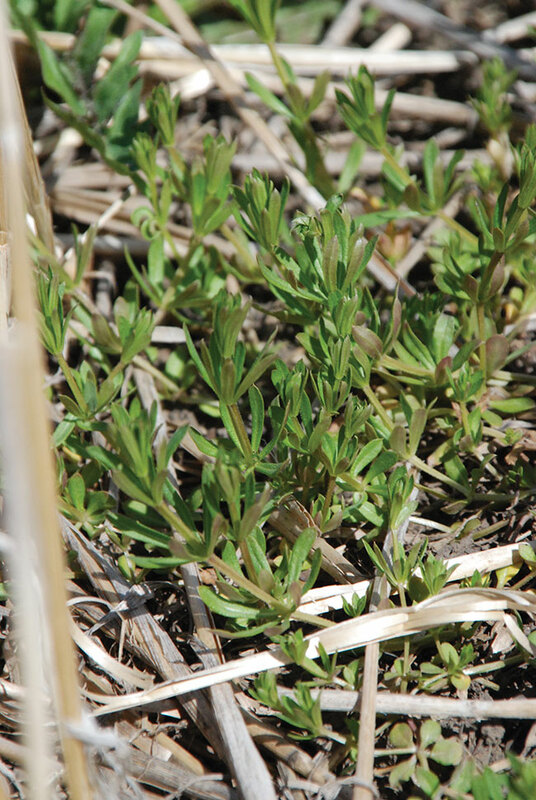 As well, recent weed surveys showed that about 20 per cent of cleavers in Saskatchewan have evolved resistance to ALS-inhibitor herbicides, and cleavers are also considered a high-risk weed for evolved glyphosate resistance. Therefore, a better understanding of the weed biology and development of alternative management strategies is critical. 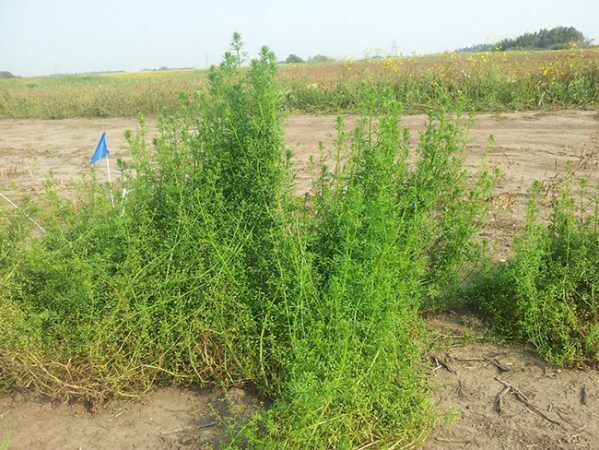 In a recent project, Willenborg and his team were interested in learning more about cleavers weed biology, first by identifying which species of cleavers are found in crop fields in Western Canada and then determining if there are differences in their emergence patterns. A second objective was to determine if a pre-harvest herbicide application could help influence the seed characteristics and reduce seed returns to the seedbank. As more growers are wanting to move to straight cut harvest of canola, researchers were interested in finding out if pre-harvest herbicides could help reduce the viability of the large number of seeds, up to 10,000 seeds per acre, produced by cleavers plants. Cleavers can reduce crop yield and quality and can interfere with harvest operations. Photo by Bruce Barker. The two main cleavers species researchers expected to find included Galium aparine (cleavers or catchweed bedstraw) and Galium spurium (false cleavers), which are problematic weed species in canola. A large number of seed samples were collected from seed cleaners and growers across a large area. Researchers were surprised by the results of the molecular work, which showed that all of the populations collected were actually G. spurium. G. aparine, which tends to prefer wetter, shadier more hedgerow type habitats, may also found in some locations in Western Canada, although none of the samples processed by the team were G. aparine. To determine the base temperature, all of the populations were screened using a thermogradient plate technology located at Agriculture and Agri-Food Canada, which includes a number of individual cells that can each be individually controlled to a precise temperature set at 1 C increments. This allows for properly replicated experiments, as well as the ability to sample and compare a number of populations at the same time. Large cleavers plant in the field trials. Photo courtesy of Andrea DeRoo. In the second part of the project, a two-year field study was conducted in 2016 and 2017 at two sites, including Saskatoon and Scott, to evaluate the effect of pre-harvest herbicides on cleavers contamination in canola crops, as well as mature cleavers seed viability and vigour. In the study for research purposes, several herbicides were evaluated including saflufenacil, diquat, glufosinate, saflufenacil plus glyphosate, diquat plus glyphosate, and glufosinate plus glyphosate. The researchers faced some of the same challenges growers will face in applying the pre-harvest herbicides and getting them through the canola crop canopy onto the cleavers, as well as cleavers establishment in some of the plots. However, overall the results did show a clear trend. The study showed that the glufosinate plus glyphosate and saflufenacil plus glyphosate applications resulted in significantly lower cleavers contamination and seed viability than most other treatments. These treatments allow the herbicide time to be translocated into the seeds, as compared to true desiccants that act extremely rapidly and kill the seeds they contact but don’t move in the plants. The other treatments did result in a small reduction in viability as compared to the control, but not as significant as the others. 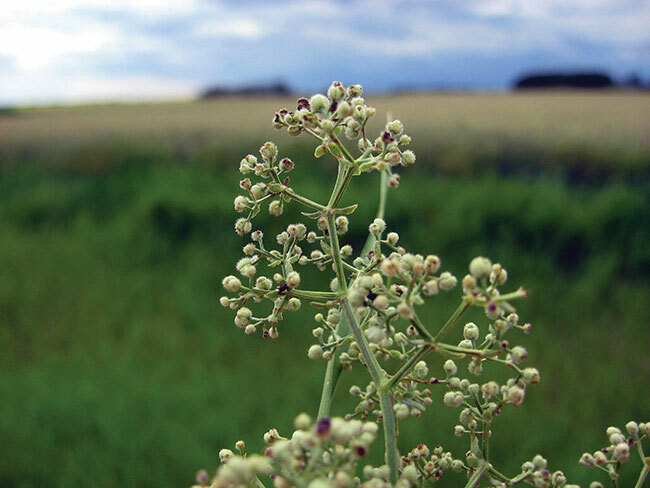 The study also showed that pre-harvest herbicides have the potential to manage cleavers seed production and reduce competition with canola by increasing seed mortality, and by reducing seed viability and vigour. Willenborg notes that for the research project, they did not test for pesticide residues. However, growers are cautioned to follow label directions for pre-harvest intervals and be aware of maximum residue limits (MRLs) and market requirements before application. “Our results show that seed shed management and managing the weed seedbank as part of an integrated weed management program is a good strategy to consider,” Willenborg says.